Fans of art history worldwide will recognise Andrew from his superb documentaries, spanning many eras and continents. He has also written some wonderful books on art and presents regularly on BBC2's The Culture Show. For more information on Andrew's appearances in, print, public, TV and cyberspace, please visit his site. In 2002, Andrew's documentary Who Killed Caravaggio? was first aired. Apart from being a unique glimpse at the tumultuous life of Michelangelo Merisi da Caravaggio through archival records and contemporary biographers such as Giovanni Baglione, it was also a precursor to this book. 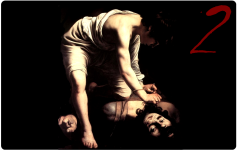 Released in July 2010, Caravaggio: A Life Sacred and Profane is a Caravaggio biography like no other. 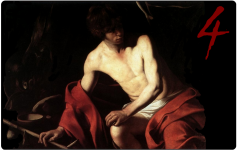 Many are the examples of indulgent writers speculating on the man Caravaggio's work suggests he may have been. This is what separates this title from the others - this is a biography constructed upon many hours of archival research, from criminal proceedings to contemporary biographies - Andrew Graham-Dixon's amazing work uncovers the realities of Caravaggio's era which no biographer before it has dared pursue in such meticulous detail. 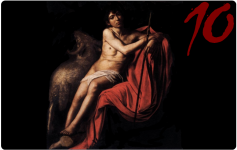 If you are excited by historical evidence, cleverly mixed in alongside some sensible discussion of the allegory and aesthetics of Caravaggio's work - you will find this book to be a thoroughly rewarding experience. 3PP: You relate the creation of this title as a project spanning a decade. What was the original impetus to contribute a new volume to the existing canon on this artist? AGD: The original impetus came from the experience of making a documentary about the artist's life, for BBC television. In the course of working on that film I came to realise that so many exciting and interesting new discoveries had been made in recent years that a new life of the artist could and should now be written, painting a much truer picture of the man and his world than had previously been possible. 3PP: The title of your new book - A Life Sacred and Profane - derives from Cardinal Ottavio Paravicino's description of Caravaggio's Boy with a Basket of Fruit - you also use this phrase to describe the Courtesan Fillide Melandroni. Was this personal struggle between a secular and spiritual existence felt as keenly in the 16th Century as it is now? AGD: I think the struggle was experienced in a different way, but it was certainly felt as keenly - I suspect more keenly. 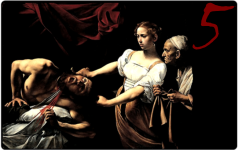 3PP: Dr. Catherine Puglisi uses the term Caravaggio-mania in describing the public and media attention so intensely focused on this artist. 2010 has seen Leonardo and Michelangelo take a back seat to the wayward Maestro Merisi. Your 2002 film Who Killed Caravaggio? seems to pre-empt this rise public interest. Did you see it coming? 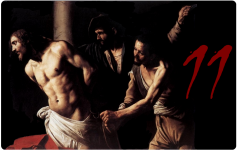 AGD: Caravaggio is an old master well suited to the modern fascination for badly behaved celebrities, but I hope anyone reading my book will begin to see the real and terrible poignancy of the life that he actually led as distinct from the many legends and clichés that have proliferated about him. 3PP: Caravaggio's images are very cinematic in nature. You heavily quote Scorsese on Caravaggio's impact on his work. 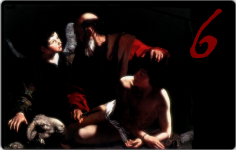 Does our familiarity with this type of graphic presentation explain Caravaggio's easier appeal to modern audiences? 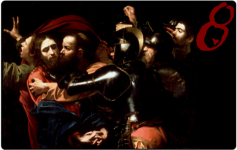 AGD: Quite possibly, although it could be argued that Caravaggio did not merely anticipate elements of modern cinema, he actually played a part in inventing the very language of modern cinematography. Think of Pasolini, for example, his directness, his often brutal use of light and dark. 3PP: You mention Venetian master Tintoretto as a probable influence. 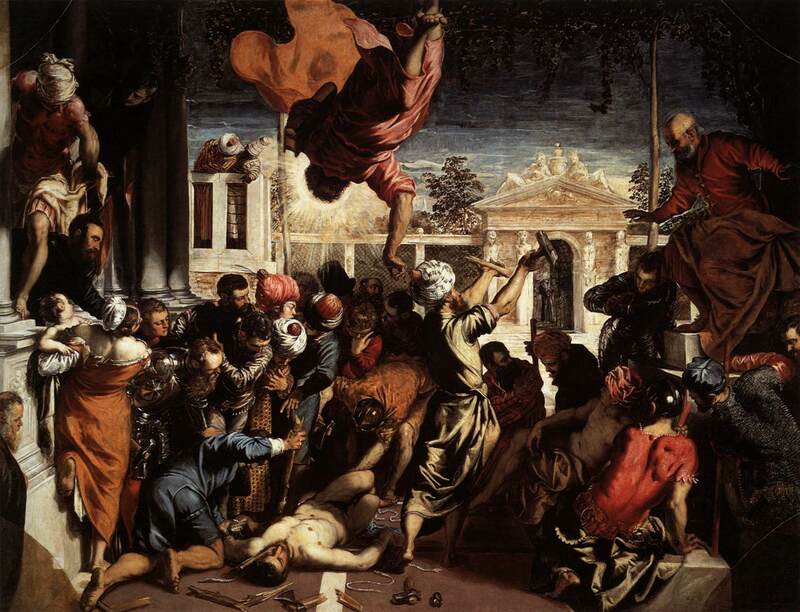 The dynamism and theatricality of a work like Tintoretto's 1548 Miracle of The Slave seems to echo in Caravaggio's The Martyrdom of St Matthew some 50 years later. Do you think artists like Tintoretto reveal Caravaggio's style as a natural progression, rather than something unprecedented and baffling as some authors have related? 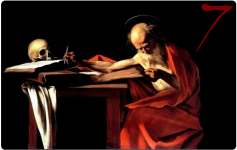 AGD: Yes, but nonetheless Caravaggio's originality was extreme. There is painting before him and painting after him, as Robert Hughes once said - and they are not the same thing. He changed art forever. Shadow and light, dramatic movement: elements of this Tintoretto painting would not look out of place with Caravaggio's name under them. To use a cinematographic term, Caravaggio is like Tintoretto in close zoom and deep focus. 3PP: In your writing, historical and scientific evidence is given equal weighting alongside descriptions of style, aesthetics and allegory. Is consideration of evidence and historical context part of how you contemplate art personally? AGD: Yes. Unless you try to understand the world in which an artist moved, felt, lived, how can you hope to understand the images that he created? 3PP: The work of Maurizio Seracini, Martin Kemp, Pascal Cotte and others has brought science and the humanities crashing together. Is there a gulf between connoisseurship and science in approaching attributions? AGD: No I don't think so. You can X-Ray a painting or use infrared to detect an underdrawing, but you still need the skills of the connoisseur to evaluate the evidence that you find. Rembrandt's underpainting is very distinctive, for example, very rapid and confident, but unless you know that you won't be able to make much sense of looking at an x-ray of a work that might or might not be by him. Caravaggio and Rembrandt are commonly compared. In this fabulous clip from The Culture Show, AGD explores these two artists in detail. 3PP: Do you see the formal introduction of these scientific methods as prerequisite to art history education in the modern era? AGD: No. Not everyone studies art history to be a connoisseur or conservator. 3PP: I am about to visit Florence for the first time - and very much look forward to my first encounter with a Botticelli! Can you recount a memorable first time beholding a great artwork? AGD: I always remember seeing a wonderful fresco by Pietro Perugino, in a tiny little chapel somewhere in some back street of Florence. It was raining outside, but there was so much light and sky in the painting walking into the church was like walking into summer. Magical. 3PP: In your film, Medici - Makers of Modern Art - you attended the parade commemorating Savonarola. Your comments to Dominican Friar Padre Tommasso echoed the horror all art lovers feel when we consider the works that may have been destroyed in the Bonfire of The Vanities. Was this a difficult experience for you? AGD: It was a moving experience, but not especially "difficult". 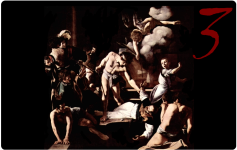 3PP: You describe extensive use of John T. Spike's Caravaggio CD-ROM resource in your researches - are there any plans to publish your work in a digital format such as a Kindle edition or audio book? AGD: Not at the moment, no. 3PP would like to thank Andrew Graham-Dixon and his wonderful staff for their time and effort, particularly as Andrew was busy filming during the time time my request was initially made. If you enjoyed this interview, I also recommend you listen to Andrew discussing Caravaggio on this BBC Radio 3 webcast. No longer available on the BBC site, this is one of the few places you can hear it! As a final demonstration of just how informative and enjoyable Andrew's work is, please watch this amazing clip from The Culture Show - a skillful one-take description of the Citizens and Kings exhibition at the Royal Academy of The Arts in 2007. 3PP, you've outdone yourself----not an easy achievement, either! I think these are the most interesting and penetrating questions that you've ever asked. 3 bravos to you! Marvelous! Boy, would I want him as a guide through some of these galleries. I'm amazed at how he could so effectively get to the heart of a painting even as he quickly strolled by it. I definitely want to enter to win that book! Well done, H! You've posed some really good questions here- and produced interesting answers by AGD. I guess I'd agree with him on the science/connoisseurship issue. Look forward to the contest- but if I don't win, I'll get the book anyway. A Caravaggio scholar told me last week that's it's a lot of fun. Incidentally, are you going to brave Michael Fried's new book on Caravaggio. He represents the heavy, theoretical side of C studies! Great job! What an interesting interview, and how exciting to have such a prominent figure interviewed on your site! Like David, if I don't win the contest, I'll get the book anyway. Caravaggio is my favorite painter of all time, and I'm always interested in reading new books about him. @David - I think I will brave Michael's book at some stage. Also, cheers on your first successful post at 3PP! I am glad the login system is behaving itself. Caravaggio is also one of my favorites. I especially like Desmond Seward's, "Caravaggio, a Passionate Life," a balanced and insightful look at his life and work. I believe that the greatest influence on Caravaggio and the Baroque is the "Spiritual Exercises of Ignatius of Loyala,' the founder of the Jesuit order. It is impossible to overestimate the influence of the Jesuits on the Baroque era. Ignatius insists on a personal, emotional response to art. Also, don't be so hard on poor Savonarola who was brutally murdered by florentine gangsters at the behest of the worst of Renaissance popes. Luther and Calvin get a free pass even though they were responsible for the destruction of countless works of art. Despite the Bonfire of the Vanities, great artists like Botticelli and Michelangelo were inspired and influenced by the Dominican preacher, who did after all free Florence from the Medici and the French and usher in the High renaissance. In the blog section of my giorgione tempesta website I have quoted from Villari's classic study of Savonarola. [I wish i knew how to provide a link here] He attributes the new naturalism of the Renaissance to Savonarola. wonderful interview. I still lose my breath when I see a Caravaggio. Cheers Frank and Bearded Lady! Here's how I learnt about linking! The Council of Trent was surely the foundation of the overtly religious themed work of the likes of Caravaggio. Since my very first taste of Savonarola at age 16 when reading Gene Brucker, I have thoroughly disliked the destructive nature of him, and all religious zealots. I think AGD was being very gracious in his response, but he just didn't look comfortable attending that procession. This is why I included the clip and the question. That moment really resonated with me. All the reign of the Dominican monk did was slam the door shut on the optimism of the classical rebirth, where sacred and spiritual wonderfully danced together. To go from paintings like La Primavera and Birth of Venus, which enjoy wonderful dual sacred and spiritual meanings, and limit the scope to the purely sacred was sad for those of us that enjoy studying the effects of classical learning on later societies. All this period did was pave the way for a Medici resurgence - they were exiled as powerful merchants, and returned as pseudo Royalty by Papal decree. @Bearded Lady! I will be seeing my first Caravaggio in a couple of weeks!! Can't wait! I don't see how Savonarola shut the door on anything. The year after his death in 1498 Michelangelo did the Pieta. The David was completed in 1504. all of his paintings and frescoes followed! Raphael arrives in Florence in 1504 and associates with Fra Bartolommeo, who had been so moved by Savonarola's death that he became a Dominican himself. A few years later Raphael completed the Stanza, perhaps the ultimate attempt to fuse the Classical and the Christian worlds. In Venice all the great work of Giorgione and Titian had not even begun. How is this shutting the door? It was only after 1517 that the lines were drawn. I did not suggest that you gave Luther and Calvin a free pass, but History certainly has. We do not know what was burnt in the Bonfire of the Vanities but one only need look at the bare ruined Cathedrals and Abbeys of Europe for evidence of what happened after 1517. The very examples you have quoted are perfect descriptions of how classical forms were used to reinforce the pervading religiousity of the day. They are far removed from works commissioned by private patrons eager to explore the scholarly themes of antiquity that were related to Humanist prinicple centred around the individual. There is significant evidence of Michelangelo's displeasure at the Sistine enterprise, with his depiction of himself as a flayed skin in The Last Judgement perhaps the most telling of all. Whilst Botticelli was exploring Flora, Zephyr and Chloris, Raphael was painting overtly religious subject matter during his time under Perugino. It was only when he got to Rome, under the control of Medici popes and their sympathisers, that he played with his classical yearnings a bit more - particularly on those private commissions that we are told used to excite him to ruin. I understand how Savonarola is a hero to some. Just not me. I'm always more disposed towards the patrons, who whatever their motives may have been - incited and encouraged creativity, rather than act as overt censors of destroyers of these endeavours. Basta! Enough Savonarola. I know you're going to florence soon. Will you go anywhere else? Starting in mid-October the Tempesta will be in Padua for an exhibition commemorating the 500th anniversary of Giorgione's death. Also, I'm sure you know that Rome is the place for Caravaggio. Cheers Frank :) Interesting to know that they are moving the Tempesta for a little while. This trip will be strictly Florentine in flavour - I like doing things at my own pace and had a limited means and budget on this trip. I plan a much larger trip later on in life that will include Rome and some other centres of art and antiquity - but Florence will do for now. Hence, the glimpse of Caravaggio I'll see at the current exhibition in Florence will have to suffice :) It's more than I can see down here in Oz! I stumbled upon this blog completely by accident, and I have to say that it's the most astounding blog I have EVER seen. I am totally blown away. Cheers for the nice feedback heidenkind! I keep getting my Vicky/Vicki's mixed up too!